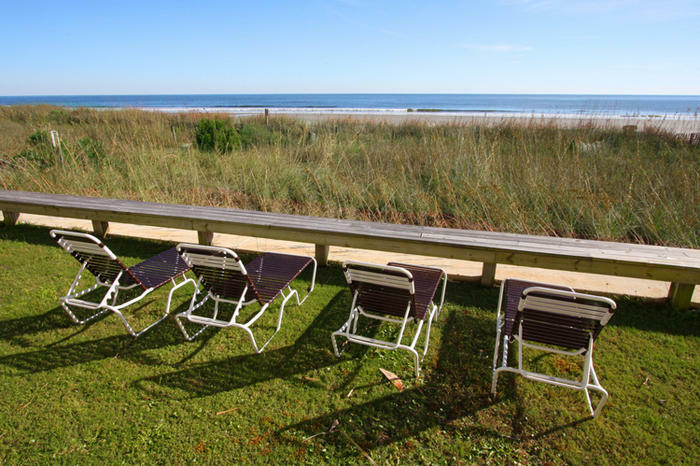 The Crescent Beach section of North Myrtle Beach, South Carolina is home to a beautiful vacation rental condo resort, Shoreham II. These condos are impressive with their sleek, contemporary design and style. The oceanfront setting and spacious balconies make these rental condos musts for a beach vacation. The master bedrooms have an oceanfront view, and the luxury continues with a Jacuzzi bathtub to bubble away your stresses. These rental condos come with flat-screen TVs and a DVD player to further enhance your home-away-from-home relaxation. Stay connected with wireless Internet access. Washers and dryers are included to make your stay convenient. Convenience is also enhanced by the elevator the Shoreham II resort houses. Shoreham II in North Myrtle Beach, South Carolina has a number of great resort amenities. The outdoor pool is beautiful, lies on the oceanfront, and includes a number of chaise lounges for reclining on the pool deck. To keep yourself in swimsuit shape, there is a fitness room available. Maximize your vacation by gazing out over the beach from the loungers placed in the green area just before the beach. A convenient covered picnic area keeps the sun at bay while you grill up your favorites, still in sight of the beach. Your vacation pleasure does not stop there at Shoreham II in North Myrtle Beach, South Carolina. The sun washed beaches of North Myrtle Beach, South Carolina are some of the most beautiful to be found. Miles and miles of white sand greet you as you walk the few steps from your rental condo at the Shoreham II resort. Put on a swimsuit, slip on some sandals, and gear up for a great day at the beach. Your rental condo is so convenient to the beach, you do not even have to make a day of it and pack up. You can slip down for an hour or two here or there without any elaborate fuss. Pick up some shells from the beach before breakfast, build a sandcastle after lunch, and walk along the beach and watch the sunset after dinner. When you can tear yourself away from the beach, North Myrtle Beach, South Carolina has a world of possibility laid out for your enjoyment. Whether you be an avid golfer, shopper, fisherman (or woman!) water sports enthusiast, or amusement park fan, North Myrtle Beach, South Carolina has what you are looking for. Do not delay, Shoreham II is waiting to make your vacation dreams a reality with beautiful beach and oceanfront rental condos at their resort. Elliott Beach Rentals is not affiliated with onsite management or the HOA of Shoreham Ii.